The First British Bouldering Guide? Clint Warren, while researching Lakeland climbing history, came across this marvelous informal bouldering diagram to the famous Y-Boulder at Wasdale Head. He conveyed the information to Michael Cocker, who sent it to me It appears in the Wastwater Hotel Visitors Book, dated 18 April 1898. The text was written by Aleister Crowley, and the drawing done by L. A. Legros. Cocker writes, "Eckenstein was also staying at the hotel and it was the occasion when Crowley and Eckenstein first became acquainted. . . . The Visitors' Book records that Crowley stayed at the hotel from 14th March to 18th April. Eckenstein from 1st to 29th April, and Legros from 7th to 20th April. 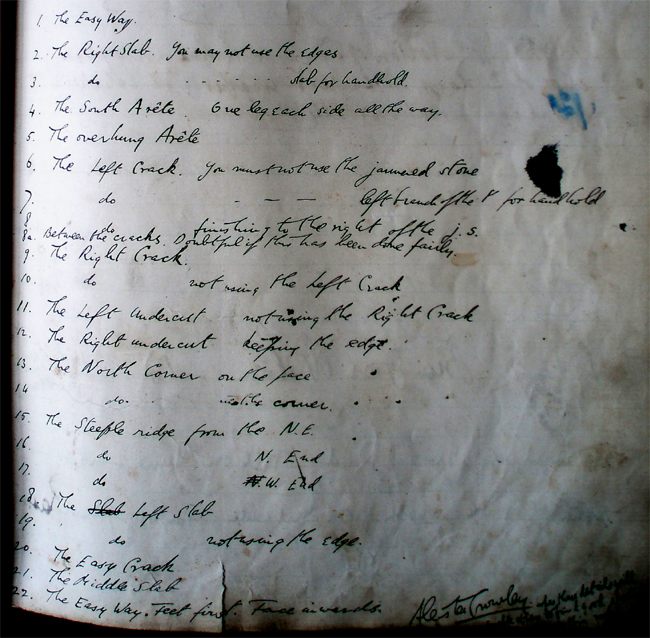 It is odd Crowley chose to write this in the Visitors' Book and not in the hotel Climbing Book, which had been functioning since 1890 and in which he had previously placed entries. I think the reason he may have put this in the Visitors' Book is, that at the time, practise climbs on boulders would not have been considered proper climbs and therefore not appropriate for the Climbing Book. This is the first reference to the Y-boulder and, although it is possible that others had played about on it before, it seems likely that it was this Easter that its real potential was discovered, with Eckenstein, Crowley, and possibly Legros playing a major role. Joseph Collier was also there (6th to 11th April) so this may well have been the occasion when he made his feet-first/upside-down ascent which is recorded as number 22." And, in a later communication, "As far as Wasdale is concerned the inclination to practise on boulders and other apparatus appears to have been something that arose spontaneously in the mid 1890s. 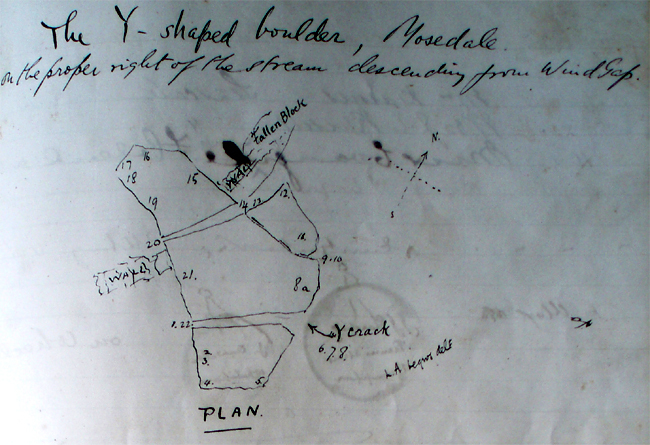 The discovery and documentation of the Y boulder occurring only a year or so after climbers had started using the billiard room, hall, landing and stairs of the hotel and the barn wall outside to work out a variety of acrobatic and gymnastic problems. The hotel proprietor, is seems, was very tolerant and there are a number of amusing anecdotes, some undoubtedly apocryphal, that have survived from this period." Lucien Alphonse Legros (1865-1933), the son of the famous artist, Alphonse Legros, was a mechanical engineer who wrote extensively about type-setting and type formats, as well as automobile construction. Crowley's Entries . . .
2. The Right Slab. You may not use the edges. 3. do. You may not use the slab for handhold. 4. The South Arete. One leg each side all the way. 6. The Left Crack. You must not use the jammed stone. 7. do. You must not use the left branch of the Y for handholds. 8a. Between the cracks. Doubtful if this has been done fairly. 10. do. Not using the Left Crack. 11. The Left Undercut. Not using the Right Crack. 12. The Right Undercut. Keeping (?) the edge. 13. The North Corner on the face. 14. do. in (?) the corner. 15. The Steeple Ridge from the NE. 19. do. Not using the edge. 22. The Easy Way. Feet first. Face inwards. Eighteen Years Later . . . Another Early Bouldering Guide . 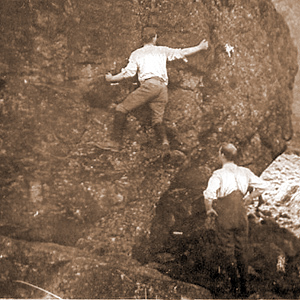 . .
Another bouldering guide was published in 1916 in the journal of the Fell & Rock Climbing Club of the English Lake District. Written by J. P. Rogers and entitled "Boulder Valley", it describes a number of problems in the Low Water area of Coniston. And, yes, the word problem appears in the text, as it does in previous literature about the area describing the efforts of the small group of climbers who founded rock climbing as a distinct sport in the period 1880-1900. "Problem", originally, was as likely to refer to a 100 foot pitch as a 15 foot boulder. As an example demonstrating the flavor of the BV article, here's a quote concerning a boulder called the Pyramid: "The northeast corner requires good balance and some care when making the foot change at the commencement, while the south end bears a somewhat evil reputation for difficulty. C. Grayson is reputed to have made it 'go', but the writer has not seen anyone do it, although the route is scratched in places." 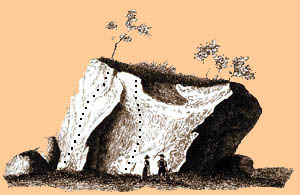 And, here, the author describes the Overhang on the Puddingstone: "The Overhang is a pure gymnastic stunt and consists in jumping for a projecting rock 8'6" from the ground and swinging up until it is under one's left armpit. Then with a sloping right foothold to assist, it is possible to draw one's-self up by means of a right handhold until a knee can be placed on the tongue. From here the rest is easy." The author concludes with the following admonition: ". . . in spite of their comparative proximity to the ground, on the majority of the courses described, a rope is essential."